Whether you’re just getting started in the lawn care and landscaping business or have been a professional for years, you can depend on Perry Hall Lawn Equipment to provide you with the best quality lawn equipment sales and services in Maryland. Our main goal is to keep your business running smoothly. Our knowledgeable staff will do their best to make sure you have the information you need before you actually purchase a lawn mower. There are several things to consider when choosing a lawn mower. The size of your lawn, your physical fitness, your amount of free time, and any features in your yard, such as hills, slopes or obstacles to mow around, and perhaps most of all, your budget. All of these factors would help you in making the best choice. For instance, if your yard is less than half an acre, a walk-behind lawn mower should do the trick. If it’s larger than that, you may want to consider a riding mower. If you have slopes or hills, a self-propelled lawn mower will make mowing the yard a whole lot easier. We also repair, service, and have parts for most kinds of lawn mowers, whether you bought it here or not. For your convenience, pickup and delivery services are available for an added fee. We even offer a zero turn mower or a push mower for rent while your lawn mower is in for repairs. Find a wide variety of residential lawn mowers for sale at Perry Hall Lawn Equipment. Our friendly and knowledgeable sales staff will help you find the lawn mower that’s right for you and your yard. Among our lawn mowers for sale include push mowers, self-propelled mowers, riding mowers, and zero turn mowers. 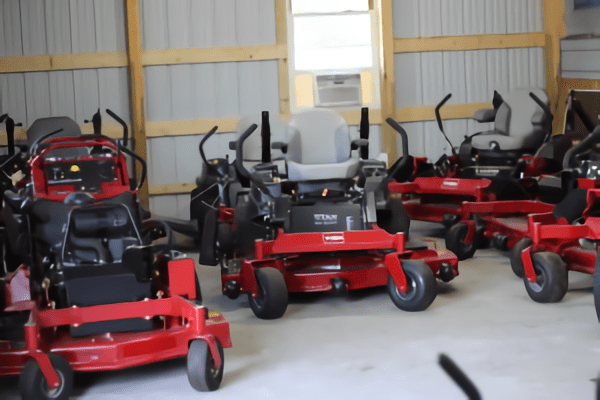 We carry an inventory from top-of-the-line manufacturers, including Toro. We have all the commercial lawn equipment to keep your business on the cutting edge. Financing is now available! We also offer service and repairs on most makes and models of commercial lawn equipment and commercial lawn mowers, whether you bought it here or not. For your convenience, pickup and delivery are available. We sell hedge and weed trimmers, leaf blowers, chainsaws, edgers, and more. 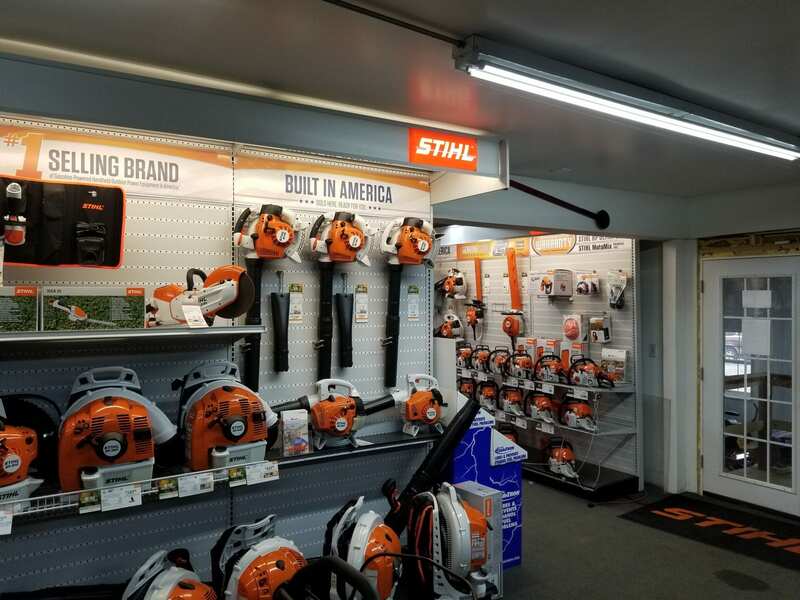 We carry a full line of outdoor power equipment for both residential and commercial use, from Stihl. Our company may not have the exact model of the tool you’re looking for in stock, but we can special order it for you. Most models come with two- or five-year warranties. Whether you need one tool or you’re starting a new landscape business and need everything, we have the outdoor power equipment to get the job done. When winter is just around the corner, you need to be prepared. Every fall, we stock up on Toro snow throwers and snow blowers to suit every location, no matter how big or small. We also do snow blower repairs if your snow removal machine needs a tune-up before winter arrives. Pickup and delivery are available for an added fee. We also carry parts for most makes and models. Many people use these terms interchangeably, but they aren’t the same. A “snow thrower” is a single-stage snow removal machine that picks up the snow in one motion and throws it out the chute in one single movement. Snow throwers are also smaller than snow blowers. Single stage snow throwers are a good option if you don’t get a lot of snow, or if you have a relatively small area to clear. A “snow blower” is a two-stage snow removal machine. The auger scoops up the snow (first stage) and feeds it to the impeller, which blows the snow out the chute, up to 50 feet. Two-stage snow blowers are bigger, wider, and more powerful, allowing them to clear a larger area. They also have higher intakes, making them able to handle deep snowdrifts. We carry a range of Toro snow blowers and snow throwers. From decks to driveways, we’ve got you covered. We have both residential and commercial snow blowers for sale, and if we don’t have the exact make and model you’re looking for, we can special order it for you. Get the gas snow blower for a powerful snow-throwing potential. Equipped with the powerful 212cc 4-Cycle OHV engine, this machine can launch snow up to 35 feet away while the patented Power Curve system cleans down to the pavement, clearing compacted snow for optimal snow removal. The snow blower features electric start, and the Power Propel self-propel system makes the unit easy to use with a heavy-duty rotor that continuously contacts the ground, propelling the unit forward. With Toro’s 2-year Guaranteed to Start Promise and warranty, you’re ready for whatever winter has in store. Toro’s top-of-the-line single-stage model, the Power Clear 721 QZR, features the innovative Quick Shoot control that allows you to change the direction of the chute instantly while you throw the snow and Zip deflector control so you can position the deflector high, low and anywhere in between. It’s 21-inch wide swath and the amazing Power Propel System makes it easy to clear snow right down to the pavement, throwing it to 35 feet away. Also featuring a powerful 212cc, Toro Premium 4-cycle OHV engine to plow through the deep snow, fold-down handle and chute makes storage or transport simple. Storage dimensions are 30″ by 21″ by 35″ and are covered by a 2-year full and 2-year guarantee to start warranties to give you peace of mind on those cold winter mornings. This product has an 18-feet clearing width and up to 25 feet of throwing distance and ideal for concrete and asphalt surfaces. It can handle snow from 2 feet to 9 feet deep. Call us at (410) 661-2884 or stop by to see and inquire from our lawn equipment sales staff. If we do not have the exact model you are looking for, we can special order it for you. We service and repair all makes and models of lawn equipment, whether you bought it from us or not.